"Weed, weed, weed, jacking off," were Josée Caron and Lucy Niles's first shouts of the night, and it was only Wednesday. "Personal Weekend" offers an explanation for their pyjama-pant nonchalance: "Tuesday is my Friday, Wednesday is my Saturday, Thursday is my day of rest." 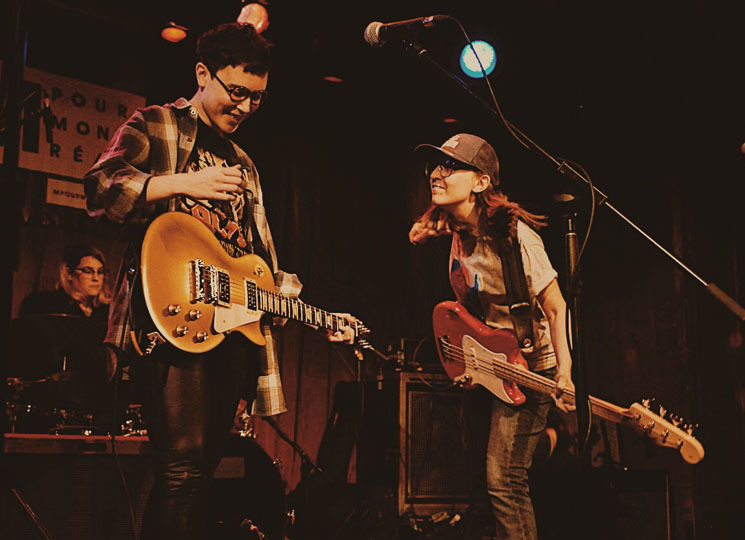 This New-Brunswick-to-Ontario duo is part Wayne's World buddy comedy and part Weezer riffs — or, as they called themselves, the "lesbian Green Day." Their lackadaisical camaraderie — very, very patient tuning — might have been annoying from any another band, but their fluky fragment-cover of "Sweet Child O' Mine" just made it feel like we'd all gone out to karaoke before ditching it altogether. Josée's eyebrows danced; Lucy's legs flopped; even the bass line giggled. The cymbal was insistent upon telling a long and meandering anecdote. Their songs were short like a stoned person's memory and their digression into Guns N' Roses meant they had less time to play their own stuff. But they paid homage to their lapses in their last song, a new one: "Well, I couldn't remember my postal code if I tried / and I couldn't remember when trash day is if I tried." Even if they forget this show, it really was a lot of fun.